Anna lives with her mother and her brother in the town of Meghri in Syunik Province. Geghecik, 39, has been out of work for a long time, and with few options for employment in Megrhi she struggles to make ends meet. Rafik recently returned from the army and resumed his studies at the Automobile Engineering Department of the Agricultural Academy of Armenia. Anna’s father Ashot died in a car crash on the road from Agarak to Meghri in 2015 on his way back from work at the Agarak Copper-Molybdenum Factory. Since his death, it has been extraordinarily hard for this family. Their total income is just $95 a month, which includes the family allowance and Anna’s benefit as the child of a single mother. Geghecik also cultivates a small plot of land behind their house where they have a few persimmon trees whose fruit they sometimes exchange for other vegetables. 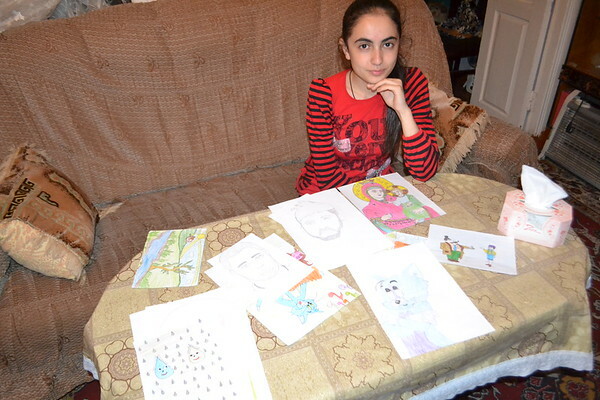 This year, Anna was included in the Children of Armenia Sponsorship Program (CASP), through which she will receive annual financial support from a U.S. family until she turns 18. CASP stipends allow families to afford the additional things they are often unable to, like firewood, gas, or school supplies. Despite the family’s hardship, Anna used her last stipend to buy Raffik new clothes upon his return from the army.